One handwritten sign says ‘Hot soup sells here’ while another offers up ‘Live rabbits, ducks, local drinks, noni (fruit) juice’. I’m drawn not so much by today’s bull foot broth, but by the bright aqua colours of the shack and the smile of a little boy I later learn goes by the name of J’Kingley. This is the roadside shop, pop-up cafe and petting zoo of the Liburd family, a joyous ramshackle place at the edge of the New River Estate on the Caribbean island of Nevis. My guava juice is not only cold and sweet, but freshly squeezed and delightfully cheap. Once a sugar plantation, the New River Estate presides on the south east of this little island measuring just six by eight miles. Most of the stone edifices of the mills and boiling and curing houses that dominated the place during the slave trade remain; in 1655 sugar was the most important export crop from Nevis, the oldest British colony in the Caribbean. Some of these old plantations lie in decay, while others have been converted into hotels, residences and restaurants. In spite of the blood and toil upon which they were built, they’re still stoically beautiful. It’s at the foot of one such mill in the Maddens area that I meet up with Alfred ‘Baba’ Tyson, a former police officer who leads nature tours of the verdant island. As we walk through the rainforest, he stops to pick up various herbs, squashes them in his hand to release the scent and asks me to guess what it is. I can’t and he tells me this one with the spicy overtones may smell like curry leaves but is actually mint basil. “We boil and make tea with it when we have a cold,” he says. “The vegetation around the tops of Mount Nevis was destroyed to such an extent that the monkey thought, ‘Me not got nothing to eat, me going down to the lowlands’. They discovered all the melons and all the ting the farmer grow and they stay put.” He points out a cashew tree from which no human ever gets nuts because the monkeys always get them first. No wonder, then, that some locals take great delight in eating monkey. “If you see ‘tree mutton’ in the supermarket, it’s monkey,” Baba warns. I leave Baba and hook up with Patterson Fleming, the maitre d’ at Nisbet Plantation, my hotel, who has a nice sideline offering guided tours of the rum shacks dotted all over the island. We meet convivial Esme, owner of Esme’s Sunrise Snackette and chat over a Mount Gay rum and Ting (popular fizzy grapefruit drink). At another bar we bump into King Dis and Dat, a calypso champion (real name Keith Scarborough MBE) who smiles as he devours his plate of chicken soup. 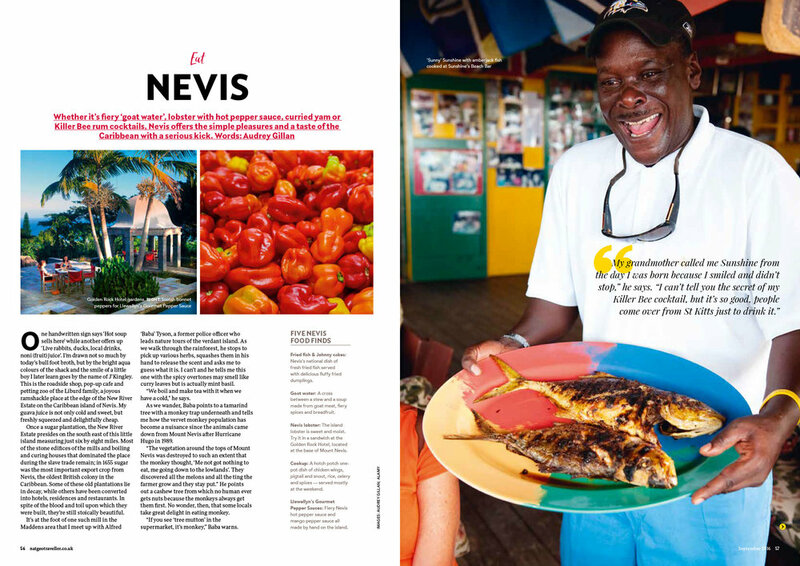 In Rawlins Village, in an area known as ‘the breadbasket of Nevis’ because of its abundance of fruit and fresh produce, I visit the industrial kitchen of British-born Llewellyn Clarke, who makes Nevis gourmet hot sauces in the basement of his in-law’s house. He shows me vast tubs of the bright red and orange fiery Scotch bonnet peppers collected and sold to him by church groups across the island. A Manchester lad, Clarke moved to Nevis to look after his elderly father and, while working as a chef, began making sauces, jams, chutneys, ice cream and sorrel wine, a kind of red liqueur traditionally drunk in the Caribbean at Christmas. At Sunshine’s, on Pinney’s Beach, the tables have bottles of Llewellyn’s hot and mango sauce and I try both with fresh lobster. The seafood flesh is soft and has a buttery flavour, perfectly matched to the hot sauce. The drink is sweet and a little spicy and I resolve that more than two would most definitely be a killer, so I err on the side of caution. Later, down at the beachfront restaurant chef Elsa teaches me the secrets of a good goat curry — it’s in the subtlety of the spices — and tells me that ‘goat water’, a Nevisian dish, is, in fact, more like a cross between a soup and a stew and is, in spite of its name, often not watery at all. Fried fish & Johnny cakes: Nevis’s national dish of fresh fried fish served with delicious fluffy fried dumplings. Llewellyn’s Gourmet Pepper Sauces: Fiery Nevis hot pepper sauce and mango pepper sauce all made by hand on the island. Perched on a hill in the middle of the Hamilton Estate, this funky restaurant and bar often has live music and is owned by Gillian Smith, a former dancer. Go there for seriously ‘good home cooking’ and to sample fiery goat water served in a traditional coal pot or the ‘taste of Nevis’ platter, with conch fritters, salt fish and Johnny cakes and tannia (a local root vegetable) fritters. How much: Three-course meal from £12 per person without wine. Under the swoosh of fans, the fine dining experience at this grand old plantation house — the ancestral home of Fanny Nisbet, wife of Horatio Nelson — takes you back in time. Each day a ‘taste of Nevis’ dish features on the largely international menu — goat water, say, or grilled mahi mahi. Housed on a converted sugar plantation, the restaurant at this boutique hotel has an outdoor terrace with far-reaching views over the island’s capital, Charlestown, and neighbouring St Kitts. Local ingredients lead the menu with starters such as breadfruit vichyssoise, curried yam and tannia hot soup and coconut-crusted shrimp.